Steel is an alloy, meaning it’s a mixture of metals, carbon and iron along with tiny amounts of phosphorous, silicon, sulphur and oxygen. There are two ways to form steel. The first is the raw material or integrated route, where professionals heat up and melt material, then mix the elements into steel. The second uses an electric arc furnace where experts place recycled steel in an oven, melting it and mixing the material with others. APX York Sheet Metal’s steel fabrication in Central PA involves four steps — deformation, machining, joining and finishing. Deformation involves different stages such as rolling, forging, drawing, bending, welding, grinding and other processes. Machining is when we remove material through techniques like laser cutting, punching and shearing. However, APX also works with spring, galvanized and plain steel. Galvanization is the process of applying a protective coating of zinc to iron or steel to eliminate rusting. The most common method involves hot-dip galvanization, where metal pieces are submerged into a molten zinc bath to protect the metal. The zinc coating prevents corrosion from reaching the underlying material and protects exposed iron or steel from scratches. Zinc acts as shielding base by corroding before the other elements. Our galvanized steel fabrication is ideal for electronics, nails, nuts, bolts, piping, transportation, playground equipment and wire rope. Carbon is the primary alloying element in carbon steel, having no more than 1.65 percent of manganese and 0.6 percent of silicon and copper. It has various levels of formability and the amount of carbon in steel dictates its mechanical properties. Carbon steel fabrication in Central PA from APX is your best bet for top-quality and reliable results. Stainless steel laser cutting services in Northern Maryland from APX York Sheet Metal can improve an existing product or create a new one depending on your needs. We tailor to our unique projects to form custom solutions and can augment products or create replicas. Our engineers often build from the ground up and complete plans from start to finish — from design to manufacturing. As a steel fabrication company in Central PA, APX York Sheet Metal specialists work with processes like bending, inserts, welding, grinding and painting. We are your go-to steel fabricators in Northern Maryland that offer superior customer service and quick turnaround times. 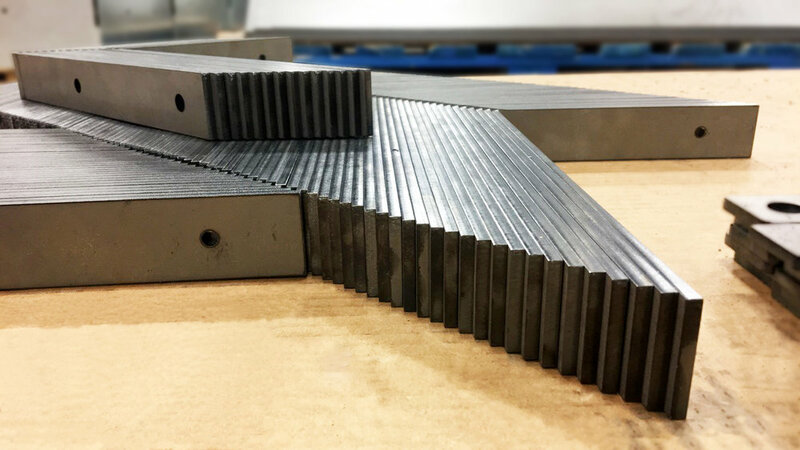 While our stainless steel sheet metal fabrication solutions can take on significant projects in large quantities, we also complete more intricate tasks to fit your needs. Submit a contact form or call 717-767-2704 for a free quote or to speak with an APX representative who can help you determine your next step.